– work on new posy pins throughout the day – fun fun colors! – what are we supposed to be doing for home school today? – pass out flyers for next wednesday’s boutique HERE! – got new business cards – thanks, j! your package is coming soon – we keep adding to it! – mom and dad are here – yay! – i really want to cut some of my new fabric for more projects, but i literally have PILES of works-in-progress that i need to get through first. 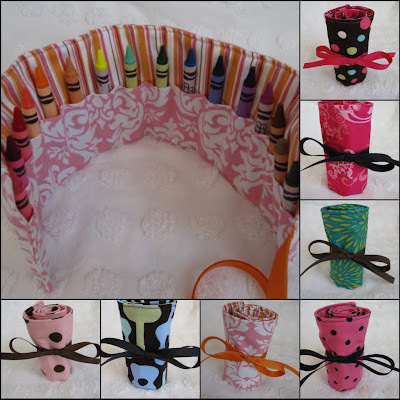 but crayon rolls are done – 24 of them! – ohh! nicole and fam will be here next friday for easter!!! – try to sneak in a date with the hubs this week. please mom? – take pics of the loft. its been painted for awhile now. beautiful! – its 7:56 and gracie is still sleeping. lucky girl. – stop rambling. go make breakfast. 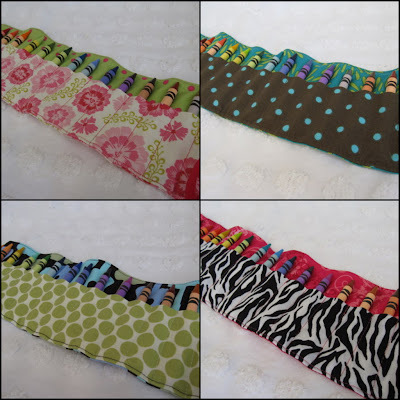 6 comments for "random thoughts"
new crayon rolls are in the shop, and more are on their way! 4 comments for "on a roll"